It’s #PlasticFreeJuly and I’m trying my best to reduce my plastic, trying not to buy products wrapped in it, made from it, and if I already have some, use it-re use it and recycle. 100%PURE a well established brand, they already have their own store at the Mall close to my house, and that makes me very happy.They offer a variety of makeup products in cardboard,such as eyeshadow palettes, and metal compacts, such as powders,bronzers, blushes,highlighters.They don’t offer exclusively plastic free only products, but they care lots of glass packaging,plust containers are all recyclable cardboard. RMS BEAUTY is another well established brand, organic and cruelty free, well known for their mini glass pots of makeup with a metallic lid made of stainless steel (oh they do have a plastic insert in the cap), easy to carry around and apply with fingers. ECCO BELLA They have a variety of reliable compacts made from cardboard, where you can carry their highly pigmented makeup refills, or you can keep them in their mini cute cardboard box they come in. ANTONYM COSMETICS is very popular for their beautiful bamboo packaging.Their products are certified organic,vegan and cruelty free. The outer packaging is made from FSC certified paper for the outer packaging. 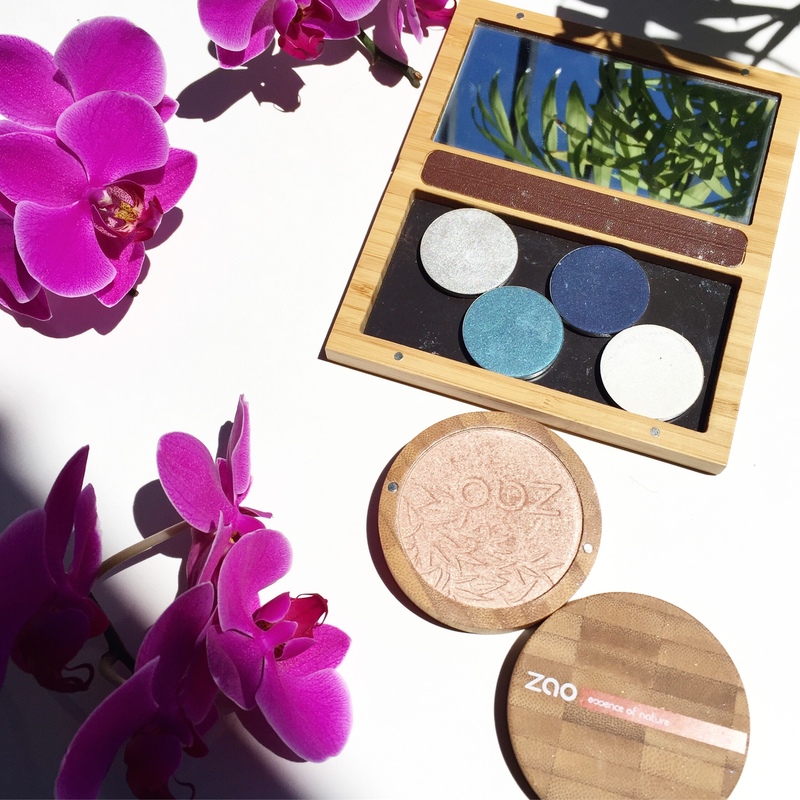 ZAO ORGANIC MAKEUP has beautiful organic products in bamboo containers and refillable compacts. SAPPHO ORGANIC has organic, vegan and cruelty free makeup products, glass pots, compacts and refills. KJAER WEIS their offer organic and cruelty free makeup metallic compacts and also refills( refillable mascara! ).Their compacts are made out of stainless steel,that has a 100% recycle rate.They are very heavy and stylish, and they will last a lifetime. ELATE BEAUTY has beautiful bamboo packaging, they are vegan and cruelty free,and is a really popular brand for zero wasters since they carry refills. ROOT PRETTY has a bunch of pressed refill eyeshadows that can be easily put in a z palette, also made with organic ingredients and super pigmented, but if I remember right, they come in a plastic case container,bohoo. Here are more brands I didn’t personally tried, but they carry plastic free packaging, and I would like to try in the future: Axiology, Tata Harper, Besame, Gressa, Naked Truth Beauty, Clean Faced Cosmetics.